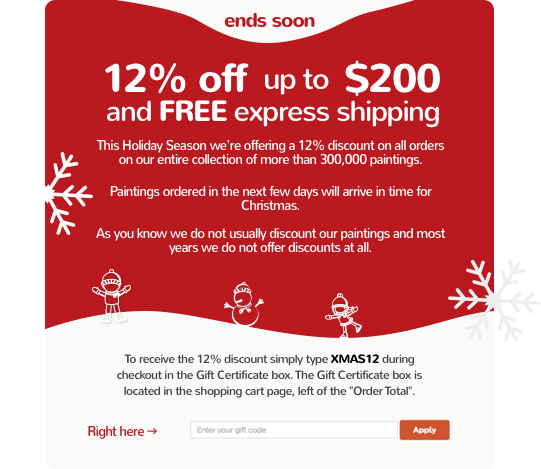 In just 14 days you could own a copy of a Van Gogh, Monet, Klimt, or any one of our over 5,000 artists. And we arent talking about a print or some kind of computer-aided copy. At 1st Art Gallery, we offer handmade, oil on canvas reproductions of the most famous works of art. Whats more amazing than our selection and our prices? Our customer service. Well work with you throughout the process to make sure that the painting you receive is exactly what you want. Imagine displaying museum quality art in your own living room or at your office. Now, thats a great way to impress friends, neighbors and clients alike. How about giving the Mona Lisa as a gift? 1st Art Gallery Makes it all possible. Unlike our competitors, theres no high-tech wizardry, computer tricks or printing presses behind our artwork. All of our paintings are 100% handmade on a blank canvas with oils. Our experienced artists work the same way that Da Vinci, Monet and Pissaro did. They start with a sketch, add details, fill in the colors, add textures and highlights, and the results are extraordinary. In the end, youll own a true work of art. This is how we work. We can recreate by hand every major work by every important artist who ever held a brush to canvas. Want some samples? Point and click through our gallery thats searchable by artists, movements, subjects, collections and even museums. On the rare occasion that we dont have the piece youre looking for, click here to let us know your request. We will find it and reproduce it for you. Are you ready to hang the works of a master on your walls? At our prices, you may want more than one. Start by browsing our gallery. Think back to your wedding photos. 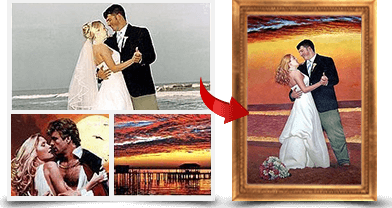 We can turn your favorite into a one-of-a-kind wedding portrait. Thats an anniversary gift shell treasure for decades. Yes, our artists do more than recreate classics  they also create new ones. They can recreate the smallest detail and capture every nuance of a photo. Working from a photograph, we can capture a brides glow, a daughters smile, a grandfathers eyes or even a pets mischief. And all for a price thats even more amazing. See some examples of our custom paintings. Our artists can also combine, edit and alter photos to create entirely new pieces. Since were working from scratch on a blank canvas, we can paint in a new background, add or subtract people or objects and paint it in any style. We can recreate family reunions, add a dramatic setting to a portrait or even place your family into famous works of art. Here are some other examples of our composite works.